I have come to the conclusion that it's me. Time travel and parallel universes as themes keep coming back over and over and while I have my reservations, I can only assume that everybody else is okay with these ideas. Any book or movie involves a story where we, the audience, are presented with something which has to be plausible. If it doesn't appear "real", we aren't going to buy into it and we'll all be giving it thumbs down. The same is true of fantasy or science fiction but even more so. Here, we are really pushing the envelope in asking people to suspend belief. In fact, we are ofttimes throwing reality right out the window and the premise asks us to go down the rabbit hole. Nevertheless, there is still a goal to somehow tie this together with a degree of plausibility or once again, we the audience are not going to buy into it. Now that I've given you the idea I didn't like the movie, I'm going to tell you it's a good movie. It is well written, beautifully shot, and has characters you can invest in. Standing at 90% in Rotten Tomatoes, the consensus of opinion of the critics is not just good, it's great. Being a fan of the Rotten Tomatoes system, that rating unto itself is enough to have me go see a movie. Now for a spoiler alert as I describe a bit about the plot. A soldier Captain Colter Stevens (Jake Gyllenhaal) wakes up in the body of an unknown man can't figure out what's going on, and then dies in the bombing of a commuter train. However he wakes up in some mysterious chamber where he learns he's part of some government experiment called the "Source Code". This system allows him to relive the last eight minutes of another man's life during which he must collect clues and do detective work to find out the identity of the bomber and hopefully stop this person from committing an even greater atrocity. Stevens is sent back to relive these last eight minutes over and over again in what many are going to connect to the famous 1993 comedy film Groundhog Day. That is the only connection as this film is anything but a comedy. This is a dramatic who-done-it with plot twists and a science fiction suspension of reality. Ah but like Groundhog Day we do have a love story. I think Roger Ebert is discussing this film (he gave it three and a half stars out of four) hit the nail on the head when he called the science of this science fiction preposterous. He goes on to admit, like we all do, that preposterous science is necessary for stories like Star Trek. Yes, it's not "true" right now, but it does seem plausible that one day, such science will in fact exist. Once we accept this premise, we can move onto the story itself and get into it. Once we accept spaceships can travel at "warp speed", we can move onto all the wonderful stories that make up the world of Star Trek. Is that asking so much? For me, the breakdown of the logic of the concept came when the reliving the last eight minutes of this dead man's life crossed over into reality. Like the last scene of Inception when the protagonist twirls the top to determine if he's in a dream or reality, Source Code ends off with this strange cross-over from dream sequence to real life which doesn't make sense. Yes, it's a plot device meant to startle us, make us all go "Ooooo" then have us all scratch our heads, but while everybody else is cogitating on the implications of this new piece of information in the story, I'm thinking to myself, "Hey! That didn't make any sense." Comics were notorious for pulling this type of fast one in order to boost their sales. How many times over the years was the superhero like Superman himself killed with an sad issue of the comic declaring this was it, the end of line, the big man himself is gone, only to have the writers turn around and say, "Nope, the big guy is still with us. That was a parallel universe. He died there but didn't die in our universe." Ah, come on. Cheap trick. You can do better than that. Can't you? Okay, I'm razzing on one small part of the plot. It's just me. I've got a thing about anybody who concocts a story and inadvertently paints themselves into a corner then uses time travel or parallel universes as a plot device to say, "Nope. I'm not stuck. I'm still in command of my storyline." This butler didn't do it; it was a cyborg butler sent from the future of parallel universe number two meant to affect the past of our world. I'm now rolling my eyes while quietly muttering to myself, "Oh brother!" Overall, the film is good. At 90%, you will want to see this and you will enjoy it. I did have a soft spot for the love story and the idea of our soldier having a second chance at love and life. 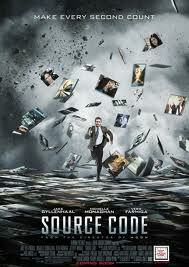 Source Code is directed by Duncan Jones (Moon) and stars Michelle Monaghan (Eagle Eye, Due Date), Vera Farmiga (Up in the Air, The Departed), and Jeffrey Wright (Quantum of Solace, Syriana). Source Code is a 2011 American science fiction thriller film directed by Duncan Jones, written by Ben Ripley, starring Jake Gyllenhaal, Michelle Monaghan, Vera Farmiga and Jeffrey Wright. It was released on April 1, 2011 in North America and Europe by Summit Entertainment. A time loop or temporal loop is a common plot device in science fiction (especially in universes where time travel is commonplace) in which time runs normally for a set period (usually a day or a few hours) but then skips back like a broken record. When the time loop "resets", the memories of most characters are reset (i.e. they forget all that happened). This situation resembles the mythological punishment of Sisyphus, condemned to repeatedly push a stone uphill only to have it roll back down once he reached the top, and Prometheus, condemned to have his liver torn out and eaten by an eagle each morning. The plot is advanced by having one or more central characters retain their memory or become aware of the loop through déjà vu. One well-known example of this is in the 1993 film Groundhog Day, in which the main character is the only one aware of the time loop. Stories with time loops commonly center on correcting past mistakes or on getting a character to recognize some key truth; escape from the loop may then follow. ok! i skipped past a bit to not ruin the movie but the gist of it it is i'll like it :) ty!